Not as cheap as the Global Ordnance deal, but cheap for Remington. PSA has Remington UMC Freedom buckets on sale. 160 rounds of OTFB 120 gr ammo per bucket. 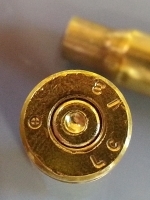 I've never shot any but based on the comments it appears to be good ammo with Barnes brass. $79.99 per bucket + shipping. Works out to be around $0.55/round. For comparison my local Walmart sells a box for $13.54 + tax, so about $0.71/rd. Sale good through noon tomorrow (4/16).